Recently, I had to setup Unity IoC container in an existing ASP.NET 3.5 Web Forms application. This application had not only web pages (.aspx files), but also some Web Services (.asmx files). After some research, I found out David Hayden’s screencast: Unity IoC and ASP.NET screencast – Dependency Injection into Web Pages. You can use a similar technique for your Web Services – that’s what I’ll show you in this article. The first step is to setup Unity Container in Global.asax file. This is a good place to do it because it can be accessed either by web pages or by web services. The CreateContainer() method is the place where the dependencies are specified. Create a generic BaseService that all your services will inherit from. 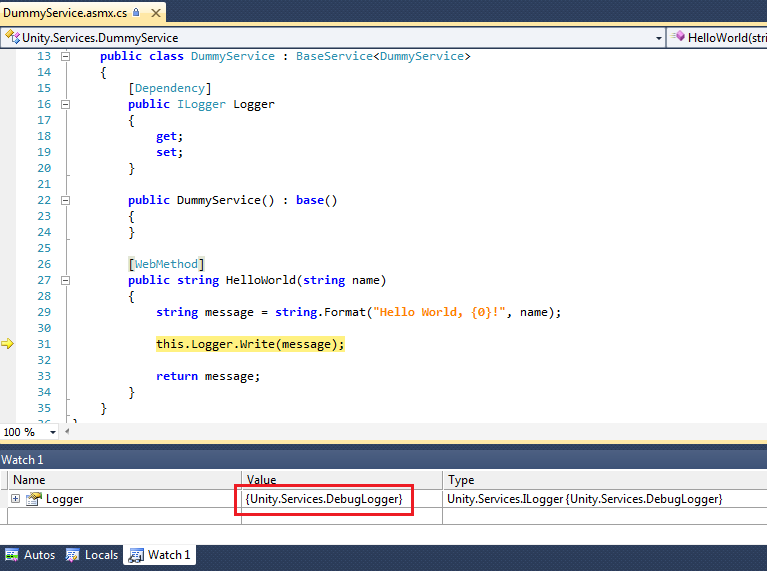 The dependencies will be injected when you create an instance of the service (default constructor). Now all you need to do is to inherit from the BaseService and invoke its base constructor. Don’t forget to add the [Dependency] attribute to your dependency, and it has to be public. This entry was posted in .NET, CodeProject, Design Patterns, Patterns and Practices and tagged C#, Dependency Injection, Enterprise Library, IoC, Unity, Web Services by Rui Jarimba. Bookmark the permalink.